On October 7, 2016, residents of Gabbs had little notice that the Navy was coming. There is no newspaper in Gabbs, Nevada, a quiet mining and ranching community about an hour and forty-five minutes northeast of Bishop, California. Nothing was posted or publicized about the last of the Navy’s public meetings, unless one knew to look at the Navy’s website. Word traveled anyway. About eighty people, many coming over a hundred miles, gathered in the high school auditorium wanting to know why the Navy needed 604,789 acres (945 square miles) of public lands from Churchill, Pershing, Mineral, and Nye County in Nevada, and why, in particular, everything northwest of Gabbs would become a 178,015 acre bombing range. Navy to expand bombing ranges in Northern Nevada. The deadline for public comment is November 25. Seventy miles east of Reno, where US 95 intersects Highway 50, the loneliest road in America, are the headquarters for the Navy’s Fallon Range Training Complex (FRTC). The complex currently operates on 202,859 acres of withdrawn BLM public lands, primarily composed of four bombing and training ranges known as Bravo 16, Bravo 17, Bravo 19, and Bravo 20. The public lands they are planning to withdraw will increase the complex to 807,658 acres. Such an expansion also calls for major modifications to thousands of miles of airspace above it all. The Navy’s requested expansion will overlap the Pony Express National Historic Trail, which follows Highway 50, and permanently close portions of the Stillwater Range, Job Peak, and Clan Alpine Mountains Wilderness Study Areas north of Highway 50. From Highway 50 to the south, the Dixie Valley quietly resolves into the canyons and ridges of the Monte Cristo Mountain Range, along the open rolling vistas of sagebrush steppe. Here, where the local community organizations came together to install wildlife guzzlers for the desert bighorn sheep and pronghorn antelope will be the bombing range, Bravo-17. The Navy’s presentation in Gabbs, and earlier in the day in Hawthorne, with its carefully edited and cropped maps, did not fully convey the massive scale of the proposed land withdrawal, making it difficult for the layman to adequately weigh in on the expansion. Absent from the meeting were the Navy’s partners⏤Bureau of Land Management (BLM), US Fish and Wildlife Service (USFWS), and Nevada Department of Wildlife (NDOW). The BLM’s website indicates that the impacted areas will include sage grouse habitat, right-of-way corridors, grazing allotments, mineral and geothermal claims, the current Vegas to Reno Off-Highway Race course, and miles of backcountry roads. Residents, recreationists, miners, ranchers, hunters and the public will lose complete access to approximately 390,345 additional acres. Parts of the Stillwater Wildlife Refuge will fall within expanded area. What will rural life be like next to a bombing range? People are concerned about stray bombs missing targets, depressed property prices, how live bombing will affect wildlife within the range, loss of income, listening to exploding ordnance, and ultimately what life will be like living next to an active bombing range. David Halloran, Commanding Officer at the Fallon Range Training Complex, explained that the current range is too small to adequately train Top Gun pilots for today’s battlefield scenarios. As enemy ground to air missiles become more technologically advanced, there is a need to deploy weapons from higher elevations and greater distances from enemy fire, to keep pilots safe. When asked, why not China Lake NAWS or NAS Whidbey Island, his response was, “Fallon is the only place in the world where we can do this type of training.” A week later in Tonopah, Colonel David Avila, Commanding Officer of the Nevada Test and Training Range, echoed the sentiment at a public meeting regarding the Air Force’s planned expansion into the heart of the Desert National Wildlife Refuge—it is the only place in the world that meets training needs. As to EIS alternatives, the Navy offered nothing and presented only two proposed actions within the current Draft: 1) To renew the current public land withdrawal; expand the land ranges through additional withdrawals and modification of airspace; and, 2) No action alternative. People at the meeting expected to share their comments publicly and listen to others from the community express their concerns. They were disappointed when the microphone was turned off after the Navy’s presentation, and they were directed to give comments to the Navy’s on-site “court reporter” or to submit their written comments using the Navy’s pre-printed forms. Most walked away, distrustful of the process. In Hawthorne, NV, Jerrie Tipton, Mineral County Commissioner and Chairwoman, expressed concerns over potential lost revenues from the expansion, upwards of 15% of the county’s budget, through loss of taxes and tourist dollars. The economic ramifications for this part of Nevada are huge. Tipton said it was important for pilots to weigh in on the airspace modifications. Air Force plans expansion into Desert National Wildlife Refuge. Deadline for comments on the NTTR’s Draft LEIS is December 10, 2016. At the same time the Navy is expanding its Fallon base, in Southern Nevada, the US Air Force is planning to expand its Nevada Test and Training Range (NTTR) north of Nellis Air Base in Las Vegas, which currently operates on 2.9 million acres of withdrawn public lands. They plan to withdraw an additional 301,507 acres of public lands from the BLM. 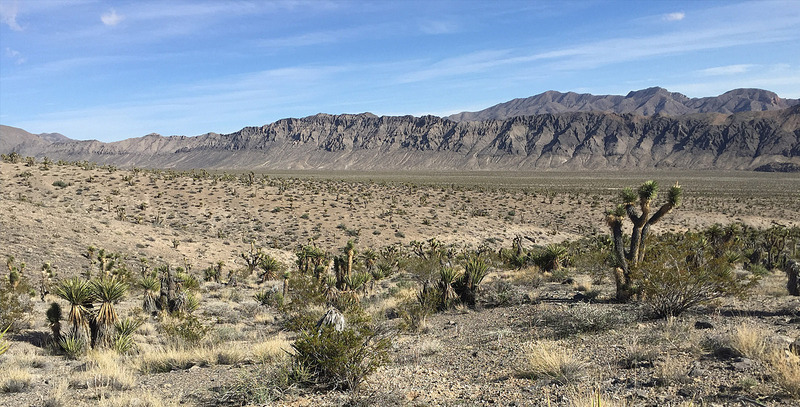 Of that, 227,000 acres, referred to as the “Alamo Expansion” (named for Alamo Road along the north side of the Sheep Range) will be taken from the heart of the Desert National Wildlife Refuge (DNWR). Of the 1.615 million acres originally set aside by Congress in 1936 for the refuge, NTTR already controls 846,000 acres. If the expansion goes through, the NTTR will control 1,129,547 acres within the refuge. As a bombing and training range, the public has no access, while the USFWS, charged with managing the refuge, has limited access. The Air Force is faced with the same battlefield challenges as the Navy, requiring weapons deployment from higher elevations and greater distances. The NTTR is divided into two ranges, North and South. Training in the North Range is limited by restricted air space access over Groom Lake aka “Area 51.” The existing bombing impact target area within South Range will not change, but its footprint will expand thousands of acres into Desert National Wildlife Refuge, increasing the training area and safety buffer zone (for accidentally deployed munitions and misfires). By closing Alamo Road, a public dirt road linking US 95 and US 93, NTTR will gain access to 100-feet of air space above the ground they do not have. Within the Sheep Range, moveable threat emitters will be used to electronically simulate enemy fire as jets fly in from Nellis. Michael Ackerman, the National Environmental Protection Act contact, said the base is already working with USFWS collaring bighorn sheep with the Sheep Range, studying population dynamics and how the sheep are using the range. Large mammals tend to habituate fairly quickly to bombing, he noted. Regardless, it is a disconcerting prospect—the incompatibility of wildlife within an active bombing range. NTTR offers four alternatives in the Draft Legislative EIS brochure which can be found on their website http://www.nttrleis.com/index.aspx. Of these, the Air Force prefers Alternative 3C, closing Alamo Road and withdrawing the 227,000 acres from the Desert National Wildlife Refuge while the USFWS supports alternatives 1 and 4a. The Sheep Range is rich in wildlife, desert flora and Native American cultural sites. Geologically diverse Hayford Peak, the highpoint of the range, has been a favorite summit of desert hikers for generations. In 1926, Nevada Governor James G. Scrugham, organized a scientific expedition to study the fauna and flora within the Hidden Forest. Scrugham’s team recorded six species of conifers that included foxtail pine, white fir, and whitebark pine, found at high elevations. Scrugham wrote about mountain lions, bobcats, desert bighorn, of finding numerous pottery shards, agave roasting pits, and an ancient temple of consisting of concentric rings and an altar. Their research helped paved the way for the 1936 creation of the refuge. Both the Navy and Air Force are seeking comments pertinent to the development of their EIS. Among the issues listed are air space, air quality/climate; airborne noise; biological resources; cultural resources, including Native American traditional resources; grazing; land use and recreation, including off-highway vehicles; minerals and mining; public health and safety; socioeconomics and environmental justice; soils; transportation; water resources and quality; hazardous materials/wastes; utilities/infrastructure; and “other” such as in the case of the Navy, not providing detailed maps within a timely fashion. Good maps showing topographical details are now available on both the FRTC and NTTR websites. Contact: Navy Fallon Range Training Complex Expansion Deadline, Nov 25. Air Force Nevada Test and Training Range Comment Deadline is Dec 10.